Monstera deliciosa is a fruit that should come with an instruction manual. Unripe fruits are chock full of oxalic acid, a substance that is used to bleach wood and clean rust off metal. 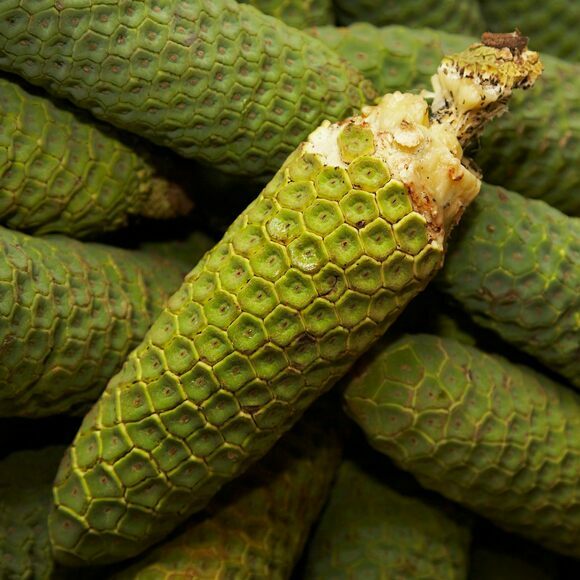 Those who make the mistake of biting into an unripe monstera experience severe throat and skin irritation. However, when ripe, this monster of a fruit is indeed delicious. The scientific name literally means “delicious monster,” an apt description given the fruit’s tasty yet dangerous potential. But the genus Monstera actually gets its name from the plant’s abnormal-looking leaves, which are very large with a strange network of holes. For this reason, it’s earned the nickname “Swiss cheese plant.” Its interesting appearance makes members of this genus a popular ornamental plant, though not all species have edible fruit. When fully ripe, the monstera offers a wonderful combination of strong tropical flavors like pineapple, coconut, and banana. In its native countries of Mexico, Guatemala, Panama, and Costa Rica, it is typically eaten on its own or prepared into jams. Chefs also whip up monstera-based desserts, either pairing the fruit with a dash of light cream or incorporating it into fruit cups or ice cream. Unlocking that flavorful potential—and avoiding any painful toxicity—is all a matter of timing. To ripen the fruit, set it inside a jar or glass and cover it with a brown bag. In time, the green hexagonal scales that make up the outer skin will slowly fall off from one end to another. You can nudge the scales off gently with a finger, but should stop if you find yourself using force. The fruit underneath will resemble an ear of corn and can be removed and eaten as it becomes exposed. If there are sections with scales that have not yet fallen off, that means those parts are still dangerous and need more time to ripen. Even when the fruit is ready to eat, patience and moderation is still essential: Eating too much of the pulp may have a laxative effect. It takes effort and care to eat a monstera, but once you’ve gone through the trouble, you will be rewarded handsomely. Even when ripe, Monstera deliciosa still contains small amounts of oxalic acid and should be avoided by those who are sensitive to it. You may also notice some black specks in the fruit. These are edible, but can irritate the mouth. They can be picked out when consuming the fruit or skimmed off the top while it’s being cooked to make jam. A New Year's Eve tradition of scarfing down 12 grapes for good luck. This butterscotch-flavored fruit has a way with desserts.